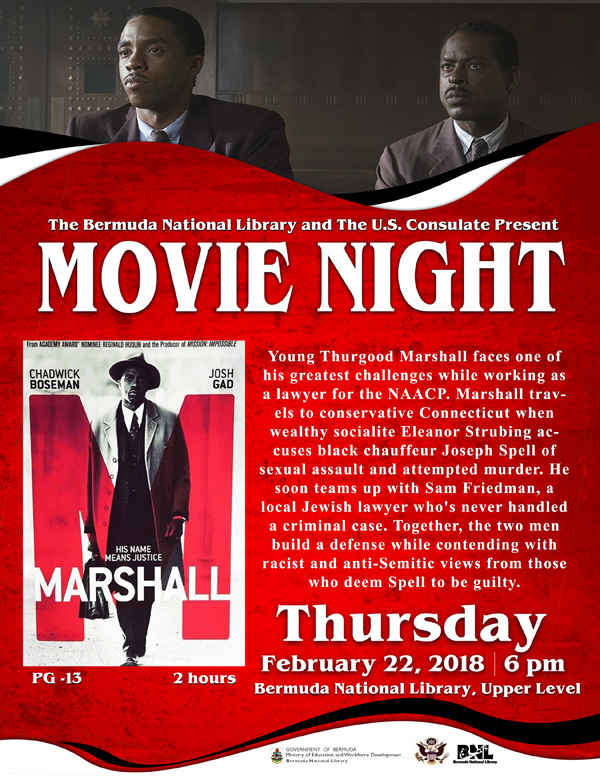 The Bermuda National Library and the U.S. Consulate will host a screening of the film Marshall in honor of Black History Month at the National Library on Queen Street on Thursday, February 22 at 6.00pm. A spokesperson said, “Marshall, tells the story of a young Thurgood Marshall as he travels across the U.S. on behalf of the NAACP defending African-Americans who have been wrongfully charged of criminal acts. The movie closely follows one of Marshall’s first major cases which took place in Connecticut. “The high profile case featured in the movie and the enduring partnership with Friedman led to the development of the NAACP legal defense fund. As legal counsel to the NAACP, Thurgood Marshall won the infamous court case Brown v. Board of Education – ending racial segregation in public schools in the United States in 1954. An American hero in the fight to end segregation in the United States, he later became the first African-American Supreme Court Justice in 1967 and served for 24 years. “The film stars Chadwick Boseman, Josh Gad, Kate Hudson, Dan Stevens, Sterling K. Brown and James Cromwell. Admission is free. Due to limited seating, guests will be accommodated on a first come, first-served basis. Would be nice to watch this at the cinema. Any chance they can donate a screening?